Tottenham striker Harry Kane was placed third. Between them, Salah and De Bruyne polled more than 90 per cent of the FWA member votes. The Egyptian, 25, becomes the first African winner of the football's oldest individual award, which has been running since 1948. 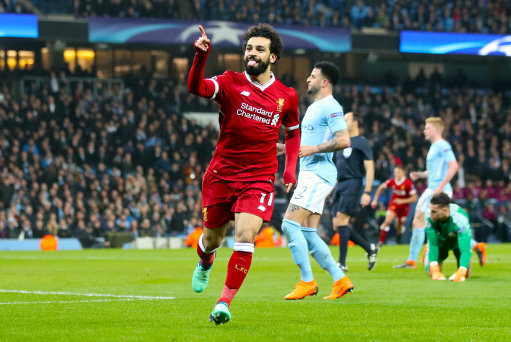 Salah will be presented with his trophy at the 2018 FWA Footballer of the Year dinner, to be held at the Landmark Hotel in London on May 10. Patrick Barclay, FWA Chairman, said: “It's been the tightest call since 1968/69, when there was a dead heat between Tony Book of Manchester City and Derby's Dave Mackay. The FWA has also introduced the inaugural FWA Women's Footballer of the Year Award, which was won by Chelsea and England forward Fran Kirby, who will collect her accolade at the gala event. Both Kirby and Salah were also voted PFA Players of the Year last month. Other players to receive votes from FWA members were, in alphabetical order: Sergio Aguero (Man City), Christian Eriksen (Tottenham), Roberto Firmino (Liverpool), Nick Pope (Burnley), David Silva (Manchester City), Raheem Sterling (Man City) and Jan Vertonghen (Tottenham). a well deserved achievement after a brilliant season from this world class player, Egyptians people should be so happy and grateful to have him in the national team.